Felix Rosenqvist recovered from an early spin to claim an unlikely victory at the season-opening Hong Kong ePrix, adding pole position and fastest lap to become only the second driver in Formula E history to seal the maximum number of points on offer from a single race. Rosenqvist went through a wide span of emotions during a weekend of high drama in the Asian metropolis, but eventually kept a clear head as he bounced back from a seemingly hopeless position to score his second Formula E win. The 26-year-old Swede got off to a frustrating start in the first of the weekend’s two races, getting t-boned by Formula E rookie Luca Filippi in the early stages and dropping down the order. Rosenqvist eventually fought his way back up to seventh, also clinching the bonus point for fastest lap. That all came to nothing, however, when Rosenqvist was handed a post-race time penalty due to a technical glitch related to the FanBoost system aboard his Mahindra Racing car, demoting him to a point-less 14th. Things, though, would take a turn for the better – much better – in the second leg of the double-header event on Sunday. Hustling his car around the tight street track in spectacular fashion, Rosenqvist powered to pole position in qualifying, overcoming the challenges presented to him by the rest of the highly-acclaimed 20-strong field. The qualifying effort means Rosenqvist has now sealed a total of four Formula E pole positions at four different tracks – Marrakesh, Berlin, Montreal and Hong Kong. That is more than one third of the venues making up the current calendar. At the start, however, things went wrong for Rosenqvist, who locked up under braking for the sharp Turn 1 hairpin and suffered an ill-timed spin. He was able to rejoin, but dropped down into 11th place. From there, he would go on to produce a memorable fightback. He first snatched tenth from Nicolas Prost on lap seven, and then took ninth place shortly afterwards when Nelson Piquet Jr. encountered problems. The next man to fall under the axe was Saturday race winner Sam Bird, who was passed by Rosenqvist on lap 12, before the recovery continued with yet another move on Oliver Turvey for P7. A final on-track manoeuvre on Jean-Eric Vergne before the pit stops yielded sixth, while a further three positions were gained as Rosenqvist overhauled Mitch Evans, Alex Lynn and the slow-stopping António Félix da Costa during the car swaps. Now incredibly up to third place, Rosenqvist set about chasing down the leading duo of Edoardo Mortara and Daniel Abt in the final half of the race, consistently lapping quicker than both men ahead as the 15-second gap began to decrease. On lap 43 out of 45, leader Mortara then made an unexpected mistake at Turn 2, losing the rear of his Venturi car while on course for victory. With Mortara spinning to a temporary halt, Abt and Rosenqvist grabbed the opportunity to squeeze ahead, completing the Swede’s rise to second. Abt, celebrating his 25th birthday, went on to claim his first-ever Formula E victory at the 35th attempt, with Rosenqvist finishing just 5.2 seconds behind his 2010 German Formula 3 rival. Mortara managed to rejoin and finish third. The drama, however, was not yet over. Abt’s Audi machine later failed post-race technical scrutineering, disqualifying the German and handing Rosenqvist the race win. This is Rosenqvist’s second victory in Formula E, following the breakthrough triumph at last season’s Berlin ePrix. Along with three bonus points for pole and one for fastest lap, Rosenqvist leaves the season-opener sitting third in the standings. 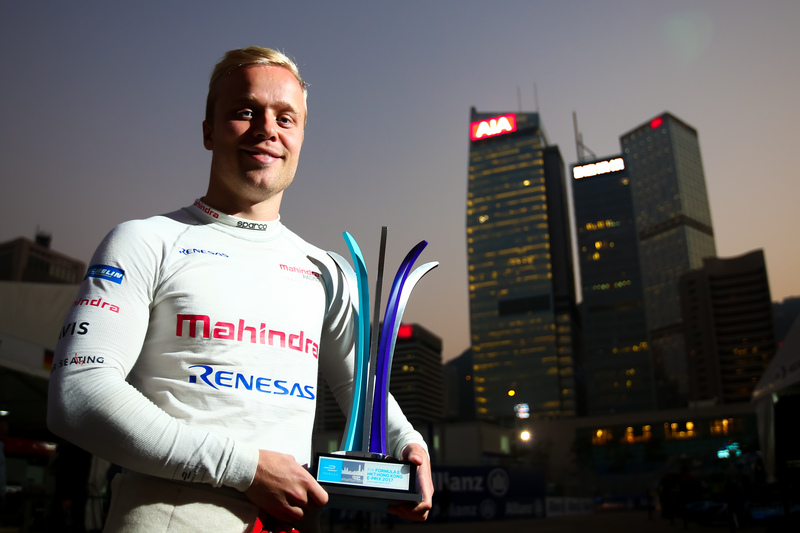 Rosenqvist becomes only the second driver in history (after Sébastien Buemi, Beijing 2015) to complete a clean-sweep of the maximum points on offer in a Formula E race. The Hong Kong ePrix marked the final weekend of racing in another hectic year for Felix Rosenqvist. The 2017-18 Formula E season resumes with the Marrakesh ePrix on January 13. 1: Sam Bird (GBR), 35 p.
2: Jean-Eric Vergne (FRA), 33 p.
3: Felix Rosenqvist (SWE), 29 p.
4: Edoardo Mortara (CHE), 24 p.
5: Mitch Evans (NZL), 15 p.